As a web developer with the Zooniverse in Oxford, one of the things I’ve been thinking a lot about lately is how we can better measure and understand who is visiting our sites and how they use them. One of the tools we use for this is Google Analytics, which breaks down visits to the site by country, demographic, language, browser and more. Today we got curious about how well known the Zooniverse is across the world, so we asked Google Analytics to tell us about which countries our visitors live in. 235, we thought? Well that’s almost every country in the world! Clearly we needed to figure out which ones were missing! This is our challenge to you, Zooniverse volunteers – Can you help us reach 100% global coverage? If someone you know will be visiting any of these 15 countries soon, please try and get them to visit www.zooniverse.org, so that we’ll be able to say that every country in the world is part of the Zooniverse! * Note: you probably would need to use an official ISP or telco of that country for the visit to show up correctly as originating from that country – and that might make some of them impossible – but we can try! Previous Previous post: Meet Annika: Our Youngest Zooite! But wait, those numbers don’t add up…? You might want to change the colour ramp on that ramp – every country looks the same colour apart from the States! It’s a good point James – certainly not much use for anyone who is colour blind! In this case the graph was generated by Google Analytics itself, so it’s not something we have any control over. It seems Guyana is a recognized country, and French Guiana is not. I will update the post and the comment accordingly. Thanks for pointing this out! If you send me the numbers – I can put a map together for you – gives me a chance to use my GIS skills! Perhaps part of the reason for mismatches is that the “country” and “IP address” mapping is not purely, and perfectly, 1:1? There surely have been visits to the Zooniverse from places such as the Åland Islands, and The Vatican (to pick just two examples), but somehow Google Analytics didn’t pick up on it. And there’s also the “does this ‘country’ even have internet?” Two examples, The Pitcairn Islands and Western Sahara … they may have a ‘country IP address’, but if there’s no server (let alone ISP) there, how could any zooite visit the Zooniverse if they were ever to go there? Going beyond a bit of fun, the use of VPNs is (or used to be) a means of getting round the ‘Great Firewall’ in China. I have no idea if any of the Zooniverse’s Talks (or before that, forums) were blocked in China (not Taiwan, Hong Kong, Macau), even if the classify pages were not (which surely has some serious implications for the various Science Teams, no? ), but given that VPNs used there are (were) overwhelmingly US, perhaps the US numbers contain a significant ‘hidden China’ component? Surely non-trivial, given the sizes of the ‘internet-connected’ populations in both countries, right? Also, if you add up all 28+ of the EU ‘countries’, does the total come close to that of the US? 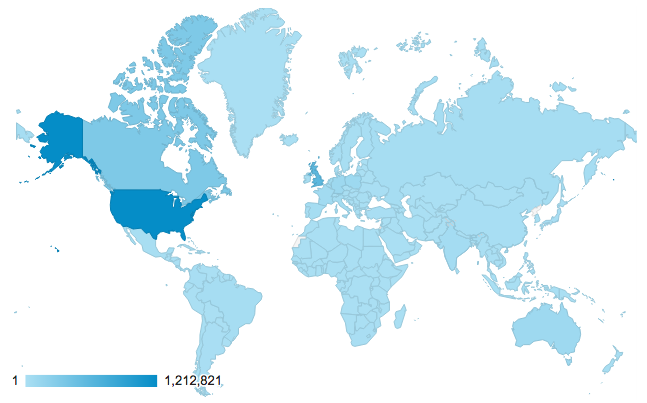 Now, these are are absolute numbers of visitors per country. In this way it seems that the Zooniverse is most popular in the US. However, if you compare these numbers with the size of population, the US comes in third place in this list. Far behind Canada and the UK. Personally I find these relative numbers more interesting.